Posted by Peeps in meal plan monday, random stuff. So, Labor Day. Already. Where has the time gone? Actually, I can tell you where some of it went. This is the result of our latest trip to the public market that happened on a non-market week. 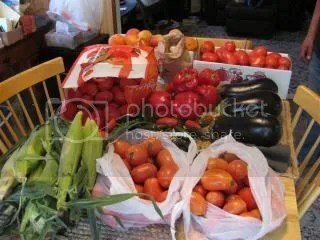 About a bushel of tomatoes, a dozen ears of corn, several eggplants, a bunch of various kinds of peppers and a peck of peaches. All in the middle of our dining room table. We spent Saturday making and canning corn salsa. Canning 10 jars of tomatoes. Making eggplant sauce as well as roasted tomato sauce. Drying tomatoes. Roasting corn and red peppers on the grill. And washing dishes. Lots of dishes. Oh, and I also put a pork shoulder on the smoker, as well. And then we went to bed at 8:30. We still have a bunch of work left. We need to get more tomatoes to can. Peaches need to be dealt with. Stuff that got frozen needs to be put away. Stuff that needs to get frozen needs to go in the freezer. This is our weekend. We are mighty tired. So, this is about all the Musings for the week. We’ll try to be back later with updates. If we’re awake. Monday – We’re going down to the in-law’s for Labor Day, so, we’re probably not going to bother with dinner. Which is okay. No dishes to do and maybe even some time to relax. Tuesday – My wife found a recipe somewhere for pasta with squash. And as it so happens, we accidentally took a container of squash out of the freezer the other day and didn’t discover what it was until it was too late to put it back. It should be interesting. Wednesday – We haven’t had meat for dinner in over a week. And while we feel all healthy and virtuous, we want meat. We took some steaks out of the freezer and those are going on the grill. Thursday – By the time the week is drawing to a close we tend to be beat. Which is why we try for Minimal Effort Thursday whenever we can. This week features eggplant parm from last week. Slap it in the oven, and we’re good to go. Friday – As always, Friday is pizza night. Pizza night is a good thing.